In this month’s 2013 Trends feature, we decided to have some fun discussing a favorite pastime of many women out there: accessorizing! As wedding planners, we encourage our brides to think about bridal jewelry (their own as well as their bridal party’s) as they move along in the planning process. Plus, playing with jewels and accessories is just plain fun! We reached out to AJ Stout, Independent Stylist for Stella & Dot, based out of San Francisco, for her expert opinion on 2013 trends. AJ also shared some photos from a recent shoot she styled using Stella & Dot jewelry, enjoy! Tell us a little bit about Stella & Dot, when and where was the company created, and how you got involved as an independent stylist. Stella & Dot was founded by our CEO Jessica Herrin as Luxe Jewels in 2003. The company evolved, and in 2007, Jessica partnered with Blythe Harris, Chief Creative Officer and re-branded Luxe Jewels as Stella & Dot, which they named after their grandmothers. The company is based in San Bruno, CA. I began working as an Independent Stylist for Stella & Dot, as a means to satisfy my need to work in a “feel good” capacity after battling Triple Negative Inflammatory breast cancer last year. Styling my clients with beautiful jewelry has motivated me and helped me make many wonderful personal connections! How does the process of seeing and selecting pieces of jewelry work with Stella & Dot? Have you ever held a special party for a bride and the members of her bridal party? Stella & Dot jewelry is designed in New York City and San Francisco and each piece is hand crafted. Our design team has worked with luxury brands like LVMH and Coach. For wedding jewelry, I have helped brides incorporate a Stella & Dot trunk show into their bridal shower so that they can earn style rewards (jewelry credit) towards their own wedding jewels, and choose jewelry for the bridesmaids, mother-of the bride, or flower girls. Typically, when the guests know their shopping benefits the bride, they are happy to shop to help her earn style rewards to look beautiful for her big day! Tell us about the price range of Stella & Dot jewelry. Half the line is under $50, which makes it affordable for most women. Our current price range is $16 – $298. Does Stella & Dot create pieces that are specifically geared towards brides? Our products are not geared to a specific occasion; however, our designers do an excellent job of having some very elegant pieces available, which I have often recommended to my bridal clients. What bridal trends have you noticed in 2013? The Great Gatsby film has influenced many bridal looks this year. As seen in the bridal photos, the Stackable Deco rings (et of 3 for $49). As well as the vintage inspired Deco Drop earrings ($44). Both pieces emulate the art deco style of The Great Gatsby. Adding a ‘pop of color’ with jewelry can really heighten the overall look of a bridal outfit. Which colors have been the most popular in 2013? The aqua stones of the Lily Chandelier earrings have been a pretty choice for my bridal clients who want to add a little color to their look, and they’re priced well at $39! What are some favorite pieces that you’ve seen brides and bridesmaids wear in 2013? In your opinion, which pieces of jewelry should a bride consider giving to her bridesmaids to wear at her wedding? I think it all depends on the dress style and is often budget driven. When I got married a few years ago, I bought matching bracelets for my bridesmaids to give them a consistent look and a little color as they were in black dresses. Something to keep in mind when giving the bridesmaids a piece of jewelry is that it’s a gift for them to wear on the wedding day and hopefully something they will want to wear again and again. In the 2013 collection, does Stella & Dot feature pieces that would be appropriate for a wide range of ages within a bridal party (i.e. the Bride, Bridesmaids, Mother of the Bride and Mother of the Groom)? We have a wonderful collection of jewelry appropriate for the different age ranges of the bridal party. I’ve also seen the mother-of-the bride choose to wear a statement necklace. Some women are reluctant to wear larger pieces of jewelry, but for a wedding where they will be wearing a glamorous dress, these pieces can really bring out the best in their personal style! I like the Marchesa necklace ($178) for a luxurious look. If you had an opportunity to style your dream wedding featuring jewelry from the 2013 Stella & Dot collection, which pieces would you include? I recently styled the following photo shoot and included pieces which really set the tone for the overall elegant theme. On the blonde model is the Metropolitan Mix Chain necklace, (was $198, now available directly through me for $99), the Glint Flower cubic zirconia earrings ($39), and one the Stackable Deco rings (set of 3 for $49). On the brunette model are the vintage inspired Deco Drop earrings ($44), as well as some very affordable bling: the Radiance Coil bracelet ($29). Thank you, AJ, for sharing all of these helpful tips and ideas! Please contact AJ directly for more information about Stella & Dot and any of the pieces she referenced in this interview: ajstoutstyle@gmail.com. And be sure to read out last installment of 2013 TRENDS focusing on Wedding Cakes with Amber McKenney of Sweet On Cake! The Big Day has come and gone in the blink of an eye! You are still running on adrenaline, feeling exhausted, and asking yourself how the wedding flew by so quickly. The good news is it’s finally honeymoon time! Say goodbye to your friends and family and take off on some much needed newlywed time to enjoy and celebrate being Mr. & Mrs.
Tackling your honeymoon packing can seem like a big task. With all of the other wedding planning and outfit styling leading up to the wedding, your honeymoon had felt so far away. I recommend packing ahead and being very strategic. It is definitely easier to pack for warm weather locations (as well as a very popular for honeymoon destinations), but you should still take time to plan ahead. – Keep in mind what activities or dinners you have planned to keep your packing focused on what you will actually wear and need – don’t just throw in every sundress or tank you own. – Don’t over pack shoes. During the day you will either wear sandals / flip flops for the beach or shoes to walk around and/or do activities. At night you really only need one pair of great wedges or dressier sandals to wear to dinner. Romantic Dinner- Having drinks after a day in the sun followed by getting dressed up for a romantic newlyweds dinner. Try to enjoy every minute and make sure to take advantage of all the honeymoon attention and perks! Click here in case you missed our last installment with BB Style, featuring Post Wedding Day Brunch Style! Welcome back to our newest installment of wedding styling tips featuring BB Style! The day after your wedding, you’re exhausted, still running on pure adrenaline and want to relax with your guests after the Big Day. You’ve pulled out all the stops with fabulous outfits throughout the week, and now your post wedding day brunch is the final event before you head out on your honeymoon (yay!). Whether your brunch is a casual “grab and go” event or a full sit down meal, you want to continue to show off your unique wedding style. – Go with a maxi dress or cute skirt and top. After being in your dress for several hours on the Big Day, dressing in a fun chic outfit for your brunch will set the casual post-wedding tone, and allow you to relax and reminisce about your wedding. – Consider opting for cute flats to give your feet a rest! – Compliment your playful brunch outfit with some colorful accessories. – It’s ok to wear your shades, especially to an outdoor brunch. I suggest shielding your tired eyes with some cat eye or round sunglasses. – Wear your new initial… there are so many cute monogramed jewelry options on the market! I love seeing these on a delicate necklace, bracelet or ring (such as the Bauble Bar Initial Disk Necklace, featured with the beach outfit). Welcome to May’s installment of 2013 Trends, where we discover this year’s innovative and ever growing world of rentals. Many of our clients, have no idea where to start, what their options are and what they’ll need to pull-off their dream event (as I’m sure many of you can relate). Not to worry, we’ve got you covered. We spoke with Melanie Leinweber and Kelly Burns-Gaoiran, expert Sales Associates with Hartmann Studios, to let us in on the latest event design and rental offerings. Q: First, tell us a little bit about Hartmann Studios and your scope of services. A: We specialize in the millions of details that work together to create an unforgettable event. In 1982, visionary, designer, and entrepreneur Bob Hartmann founded Hartmann Studios in a small warehouse in San Francisco’s South of Market area. A gifted artist, he created stunning environments for events all over the city and around the world, gaining a reputation for strong design and impeccable execution. Presently Hartmann Studios has expanded its offerings to cover virtually every aspect of event rentals. 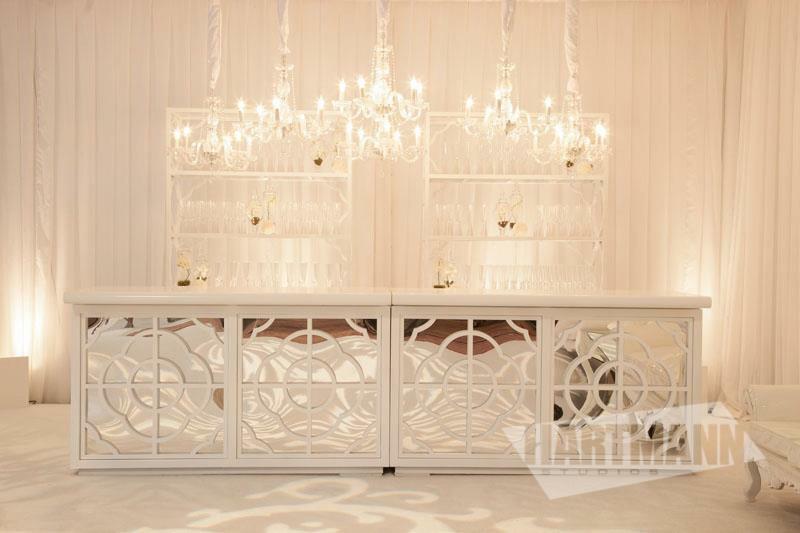 The scope of our services is unlimited – from tenting and lighting to unforgettable tabletops. 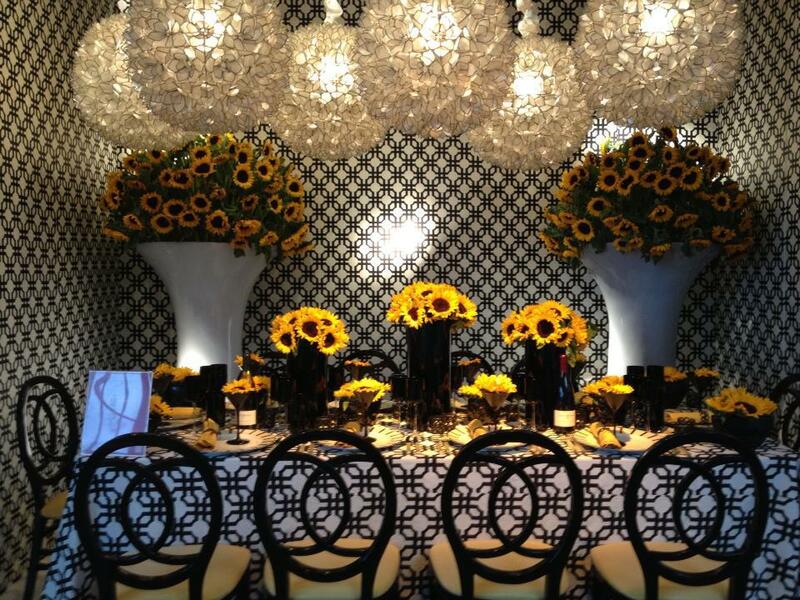 Our team of skilled designers and innovative staff work with clients to bring their custom event décor dreams to life. We work diligently with our clients to ensure that we can create anything they imagine. Q: Which items are typically found in a rental order? A: Honestly, there is no “typical” event rental order, as every event is totally different! Most wedding orders contain the basics: linens, tabletop items, chairs, etc. However within those categories our selection of items allows a bride-to-be the creative flexibility to adorn their guest’s tables from the basic to overly elaborate. Our selection of items ranges from ‘shabby chic country’ to ‘big city super modern’ and everything in between. Q: We work with budgets of all sizes. In your opinion, what kinds of rentals are absolutely necessary for a bride and groom to incorporate into their wedding reception? A: We work with brides of all size budgets as well! We feel we understand the thrifty bride who is looking for the biggest bang for her buck quite well. We believe that in order to achieve this goal, it is important for the bride to incorporate custom touches to the items provided by the Rental Company, Venue and/or Caterer. Incorporating small touches like specialty linens or upgraded glassware can make a huge impact. Placing a colorful patterned napkin on a white china setting can change the entire look of a table without stretching a bride’s budget too far. Another exciting and budget friendly trend we have recently seen is customizing the head table with upgraded specialty chairs, glassware, and table-top design which still match to the rest of the guest tables, but make the head table stand out against the rest. Q: A lot of our brides and grooms want to create the sort of reception that makes their guests feel comfortable and relaxed. What sorts of rentals do you offer that can help achieve this look and feel? A: Creating a comfortable space for the people who mean the most to you at your reception is key! We have a plethora of items to create an intimate and comfortable setting in any venue. Our selection of lounge furniture will not only give your guests a comfortable place to sit, but also successfully incorporate the theme and overall look of your wedding in to any space. Building a custom lounge space within a cozy cabana or small nook will allow all guests to take a break from the dance floor and relax in a beautiful but comfortable setting. Q: What 2012 trends will we be seeing less of in 2013? A: The year 2012 was the year of vintage rustic weddings! Corals, blush tones and ivories were big and country chic was the hot trend. So far this year we have seen our brides moving towards a much more modern feel. We’re seeing a shift from the soft and muted naturals of 2012 to brighter jewel toned color themes. We are excited about blending in the 2013 Pantone color of the year, Emerald, with the more modern and glamorous items we carry. Q: Are you seeing any innovative rentals requests in 2013? A: We’re proud to offer the newest and most exciting rentals to help brides create a truly one-of-a-kind event. We recently received a ton of new lounge furniture, and we’re getting more new products all the time. Many of the new items we have – such as bars, kiosk tables and wall flats – can be customized with a monogram or graphic from the wedding invitation to create a more personal touch. Q: What kinds of trends are you seeing in terms of wedding day flow and the rentals that are associated with such a day? A: We’ve been seeing a lot of informal wedding receptions! Couples are ditching the sit down dinner with floral centerpieces for a more relaxed reception. Receptions featuring heavy appetizers and finger food allow guests to mix and mingle without being sequestered at tables of 10. Many brides are coming in and setting up comfortable lounge settings in lieu of formal dining. We’ve even created some blended areas for guests to play games like bocce and croquet. Giving guests a more interactive space has been a big trend in 2013, with photo booths becoming more creative and popular than ever before. The “Pinterest” generation of brides has taken the “fun” reception to new heights, giving guests the opportunity to make flipbooks and other interactive party favors. Q: Would you be able to share a before and after photograph of a space to exemplify the way rentals can transform a reception and ceremony room? A: We’re proud of every wedding we do, but here are a few recent ones that turned out pretty great! Q: Keeping in mind that this all depends on the space, guest count, etc. – how much do you suggest a couple set aside for their rentals budget? A: A surprising factor some brides encounter is the fact that having a backyard wedding is not always as inexpensive as it seems. Saving on venue costs appeals to most brides, as they assume they can apply the money they save by hosting the wedding in a home towards a splurge on their décor. However many brides forget that while décor is the most fun way to spend a budget, essential items like china, flatware, glassware, tables, lighting, and sometimes even power have to be brought in. When renting a venue, many times these items will be included in the rental price, allowing the couple to use their budget to enhance the space they are renting. In a backyard wedding, much of the budget is dedicated to providing the party basics, which could leave couples missing the custom lighting and design moments they’ve been dreaming about. Q: If you had an opportunity to create your ‘dream wedding’ featuring your very favorite Hartmann rentals, what would it look like? A: Working at Hartmann, we get to look at beautiful weddings all day, so this changes on a daily basis! We’re currently obsessed with a wedding we did at Santa Lucia preserve; we think it’s the perfect blend of modern with rustic touches! Thank you, Melanie and Kelly, for sharing some helpful tips and ideas as we leap headfirst into the 2013 wedding season! In case you missed it, click here to see last month’s Trends feature on Color! Fashion Fix: Interview with Kelly Edmonson of ban.do! This week, the team at Stacy McCain Event Planning decided to have some fun and indulge our fashion forward, party loving, girlish selves a bit. We reached out to Kelly Edmonson, Director of Marketing at ban.do, to update us on all the fabulous ban.do pieces that brides and socialites alike are enjoying this year. We have to admit we’re a little jealous that Kelly’s day-to-day involves playing with feathers, sequins, confetti and glitter! Q: First, tell us a little bit about ban.do and how it all started. A: ban.do is an LA based design house specializing in accessories that really pack a punch! It all started in 2008 by two stylists, who’d both created similar headpieces for different occasions. They then thought, “Hey, these are awesome! Other people would love these… we should sell them!” In the beginning, ban.do was purely one-of-a kind couture pieces made out of vintage flowers, lace, ribbons, and other pretty things. The problem with this philosophy was that once these beautiful one-of-a kind pieces were sold, they were gone forever. As demand for the product began to grow, we started to make pieces that we could duplicate multiple times, and now we design pieces that we are able to produce on a grander scale. ban.dos for everyone! Q: How would you describe the typical ban.do girl? A: The ban.do gal is fun and definitely loves a good party. She loves all things that shimmer, sparkle & shine. She is strong & silly and also cool & quirky. She stands out in a crowd, and she always keeps you on your toes. The ban.do gal likes to sip champagne cocktails, dance under disco balls, and toss handfuls of confetti. Q: Tell us about ban.do’s range of products. A: We do it all these days! ban.do products range from our signature ban.do mini heart, mini pom pom flower, or flash bobbi sets (which start at $10) all the way up to black label pieces (priced at $350) and everything in between. Our new motto is “all day every day”; we firmly believe that there is an appropriate ban.do piece to wear to any occasion ~ big or small ~ at any time of the day or night. ban.do = all day every day! Q: We absolutely love your bridal and black label collections and think they’d be perfect for the bride who wants something different and unique for her wedding. How did you go about designing these collections, and where do you find inspiration? A: It’s all about vintage party dresses and starry Hollywood nights. As far as where we go to gather inspiration, there are lots of trips to the flea markets and nowadays, hours and hours spent on pinterest (we are totally obsessed!). After we gather our inspiration, we create a mood board and start to piece together a collection. In all honesty, it usually never turns out like we planned, but the end product is so much better than we could have ever dreamed. Q: Which colors, styles and products in your collection have been the most popular in 2013? A: This year, pink and red are staple colors in our world… and gold, we are big on gold! Women absolutely love the flash bobbi sets and buy them in every color. The sparkle and shine sets are fabulous, the twist scarfs are a dream, and the ladies go crazy for our headbands! Of course the signature ban.do heart, and pom pom flowers are always hot sellers too. We are launching our new line very soon, so there will be lots more (and other awesome stuff) where that came from! Q: What’s the most unique or over the top use of a ban.do product in a wedding that you’ve ever seen? A: The brides who wear black label are always a little more over the top, but generally our brides tend to find the piece that truly fits their personality and helps them shine on their wedding day. We love to see brides wearing ban.dos! It’s like adding sprinkles to your very favorite ice cream. Q: What is your all time favorite piece for bridal attire? A: Hands down, the crystal swirl bobbi. This is such a stunner! Q: Which ban.do products do you think would make for good bridesmaids gifts? A: We have so many options for bridesmaids gifts… there are way too many fabulous choices! I would say it is a toss up between the ban.do iphone case or our mini hearts. Q: Do you ever work with brides to create custom pieces? How does that process work? A: In the past we’ve created custom pieces for brides and absolutely loved collaborating with them, but we’ve taken a break from this for the time being… there are not enough hours in the day! We hope to bring back custom pieces in the future. Q: Finally, which ban.do piece would you wear in your own wedding? A: Ha! Well if that ever happens, I think I would wear one of our super fab black label combs. A big thank you from all of us at SMEP goes out to Kelly for providing us with our weekly fashion fix! Be sure to check out the following adorable ‘how to’ video that the girls at ban.do put together featuring their fabulous pom poms. After all, a girl can never have too many poms!